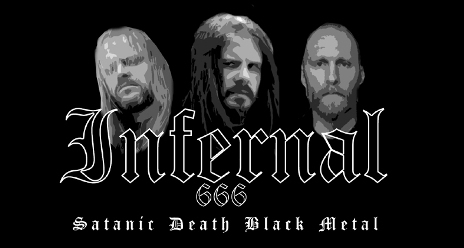 Swedish guitarist David Parland (NECROPHOBIC, DARK FUNERAL, INFERNAL) recently joined forces with drummer Tomas Asklund (ex-DARK FUNERAL, DISSECTION, INFERNAL) and guitarist Martin Halfdan (ex-NECROPHOBIC) in a brand new project called INFERNAL (which was also the name of Parland's last group that split up in 2003). Commented David, "When we started up again, we initially wanted to call the band something totally different, but we never came up with anything good enough, and whenever we did, we found out that these names already were taken. Anyway, since both myself and Tomas were members of the last real INFERNAL lineup, and the concept still remains 100% Satanic, we see no reason to not call ourselves something less good or half-assed, just because the sound mainly is no longer the hyper-blast stuff we used to do in our earlier bands. "This new INFERNAL is still purely Satanic, but generally has a more accessible sound, more melodic, but still brutal, and with some blast parts as well. We generally want to people to think of this as new band, more or less a complete rebirth of a band that once was (and still is again). We don't want people to even compare it with the old stuff since it's in most ways not the same band. "Anyway, regarding the main thing, the recordings, which should have been totally finished by now, but ain't due to one specific fact: Tomas plays drums for GORGOROTH as well, and for some reason [GORGOROTH guitarist] Roger [a.k.a. Infernus] decided to start their album recording simultaneously (about a month earlier than I was originally told) while I/we were working onthe last two tracks of the 'demo tape.' So this simply means the whole planned demo, 'The Infernal Return', is not yet fully recorded and finished. But since I see no point in waiting to upload what we have so far, and wait another one a half month to release the complete demo, we'll release what we have completed so far." * "Godforsaken (With Hate I Burn)"
* "Of The Seven Gates"